A quick update on how the weekend weather is shaping up... Fortunately, and not too far removed from how we predicted, strong to marginal severe thunderstorms avoided the metro area last evening, though there were some reports of hazardous conditions over northeast MS after midnight last night. The responsible cold front has moved well to our south and stalled across MS and AL today, which means we are on the cool side of the system. Cold in fact. At 11am, temps continue to linger in the mid 30s under cloudy skies with a north breeze. It will get no higher than 40 this afternoon as cold air continues to spill in behind the front. Weather scenario as of mid-morning Saturday. The front to the south returns north on Sunday, putting the metro back in the warm sector in preparation for another round of possible severe weather. 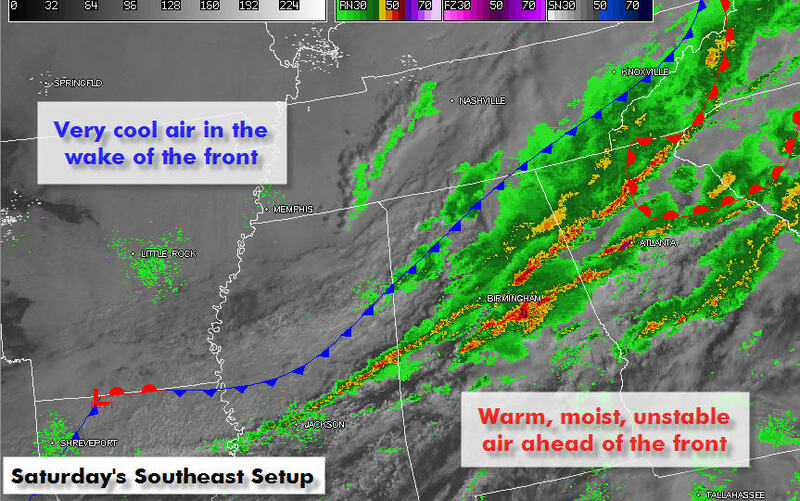 This will change overnight tonight into tomorrow however, as the front moves back north as a warm front. The moist unstable air south of the front will return Sunday and any breaks in the clouds during the afternoon will cause temperatures to soar back into the mid to upper 60s. Dewpoints will also be back up to at least 60 as a potent low pressure system moves through Missouri and wind fields strengthen. The setup is conducive for the possibility of severe weather once again. The most likely time for strong to severe storms right now appears to be between 6pm-midnight, with a heightened chance in the 8-11pm time frame. All modes of severe weather are possible, with damaging wind the main threat, though a few tornadoes are also possible. A slight risk of severe weather is currently forecast by the Storm Prediction Center. Computer models have not completely settled on a solution but are fairly similar, leading to increased confidence in the forecast. Fine tuning will be needed up until the event occurs. 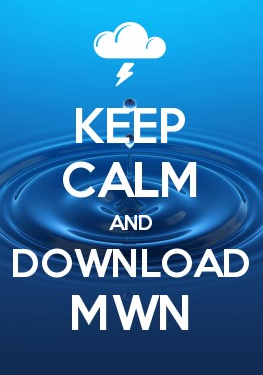 As we did Friday evening, MWN will nowcast the event - keeping Mid-Southerners up to date on the latest radar trends, any watches/warnings, timing and impacts - on our social media feeds linked below. StormWatch Twitter feeds will also automatically bring you any watches and warnings as they are issued and you are encouraged to check out StormWatch+ for Android, found in the MemphisWeather.net mobile app, which will alert you via push notification and audio alerts if severe weather threatens your specific location.